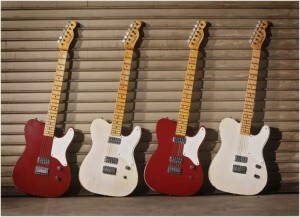 The La Cabronita Especial from Fender has gone through a few changes since its launch. 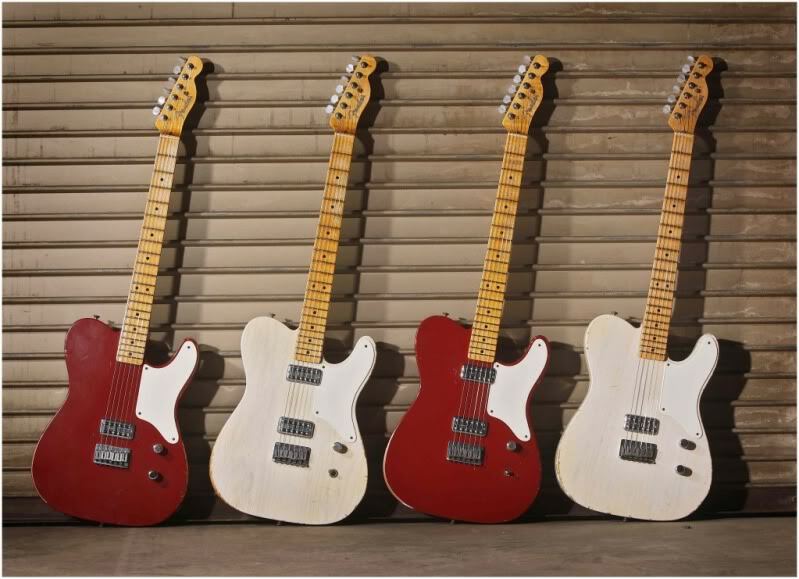 It started off as a Custom Shop Limited Edition, then a more “affordable” version was introduced as part of Fender’s “Telebration” series, and now finally Fender is producing a Mexican made “standard” version (to be released in the UK later this month). The original Custom Shop 2 pickup version came with a very cool capacitor network and S1 switch in place of a regular tone control, explained by Mike Eldred in the video below. 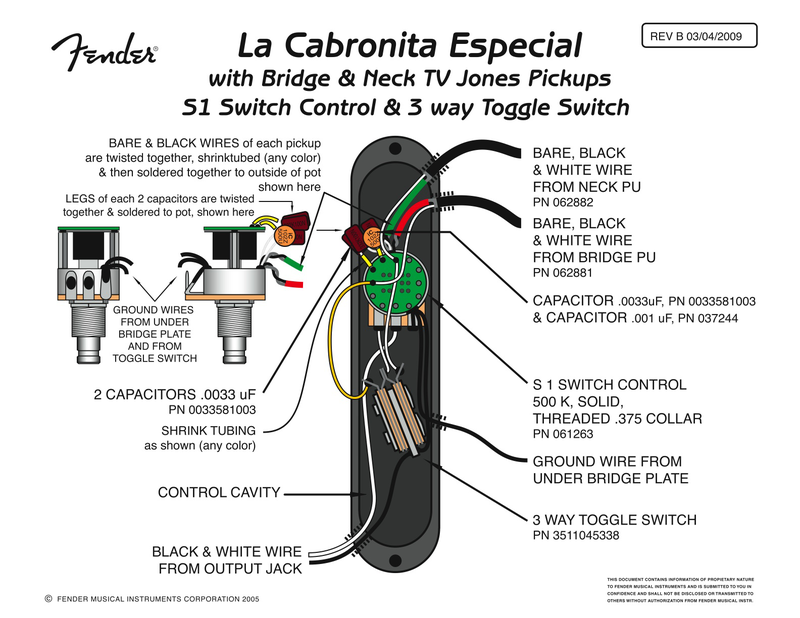 Here is the Fender wring diagram for the La Cabronita Especial. The two subsequent models come with no S1 switch at all, so no on-board tone control. The S1 switch and knob needed are rare as hen’s teeth, and expensive. Many partscaster builders either add a regular tone control or leave it out entirely. If you want to get the Fender functionality but don’t want to use an S1 switch, here is an alternative using a push/pull or push/push pot. This will take a little preparation to install as the contacts on push/pull pots are tiny, and there’s not a whole lot of space for the grounds to be attached – the usual process is to solder the grounds to the back of the pot. However there is very little space on the p/p pot, even with the ground tab at the base of the switch. Work out where you want to solder the grounds and how you plan to do it before firing up the iron! The way the S1 switch works on the CS La Cabronita is simple (in fact an S1 switch is massive overkill for this application) – each pickup has its own capacitor network for independent voicings. When the switch is disengaged, the caps are out of the system. When the switch is engaged both sets of caps are added to their respective pickups. So you have 2 voicings for each toggle switch position – pickup with no tone and pickup with fixed tone. The same functionality as the Especial for a fraction of the cost of an S1 switch and knob. I can’t take credit for working this out – one of my customers, David, did the heavy lifting testing the circuit. Many thanks, David. 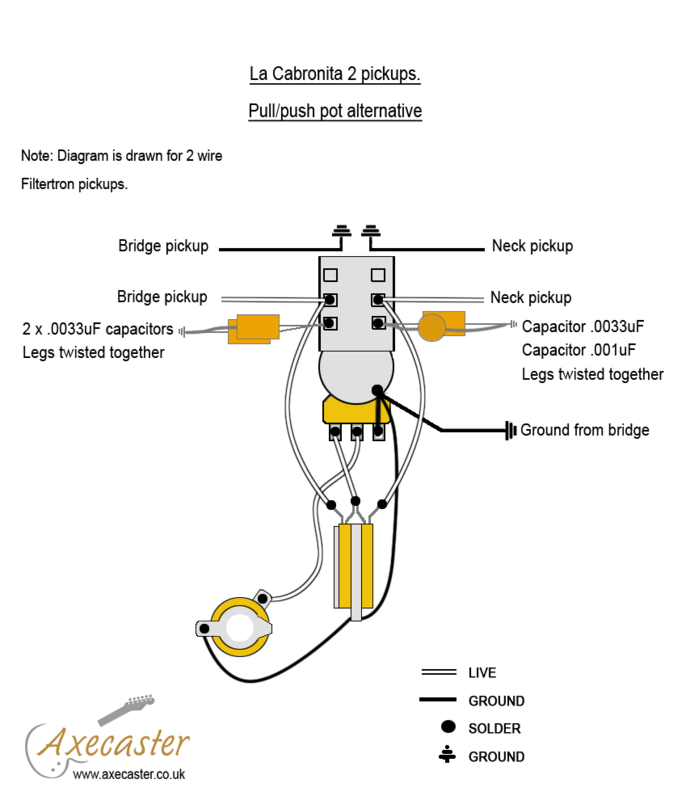 I hope someone finds this useful – I will be building a 2 pickup La Cabronita soon and will be using this scheme, so I will let you know how it turns out. UPDATE: We now have capacitor kits in stock for this mod. This entry was posted in Fender La Cabronita Modifications, General musings, Project builds and tagged Fender, La Cabronita, S1 switch, Telecaster. Bookmark the permalink. Just wanted to thank you for posting the alternate Cabronita push-pull wiring diagram. I used it on my Cabronita build, and it works great. Saved me a bunch of money and the “pull” setting adding capacitors into the circuit sounds very cool (especially with overdrive). My pleasure – glad to hear it turned out well for you. I am going to try and find the time to do the mod to my own La Cab this weekend. Hi there guys thanks for letting me know all the info means a lot I building my own cabronita twin pickup so be buying all the ferrules bridge ect from you. THANKS . Also can you tell me which ferrules are the correct ones to use so my guitar is authentic thanks chaps first thing I will order is one of your terrific hard tail bridges . BEST REGUARDS. The Mexican La Cabronita has lipped ferrules sitting proud of the body. I don’t know about the Custom Shop or Telebration versions. What size holes does your body have? I did the tone circuit mod on my Mexican Cab. The wiring’s a bit fiddly and in the end it was easier and tidier to rip out all of the old wiring and do it from scratch. Love the sound: a sort of honky alternative for not very much money. Yes, I replaced everything and kept the original wiring loom in case I ever decide to sell the guitar (highly unlikely)! Glad you like the results! I am interested in buying this wiring for my Mexican cabronita. I understand that when the S1 is not pulsed, both humbuckers pass through capacitors that add 0.033 + 0.033, that is, a capacitor of 0.068. When the S1 is pressed the humbuckers go through a capacitor of 0.034. I do not understand this very well. If for the humbuckers the right thing would be a 0.022 capacitor, right? How is the sound when it passes through 0.068 and 0.034? I appreciate your explanation in advance. On the original Custom Shop guitars when the S1 is disengaged none of the capacitors are in the circuit – you get the unfiltered pickup. When the S1 switch is engaged all the capacitors are also engaged but are different values for each pickup. This is not meant to be a tone control so regular 0.047/0.022 does not apply – this gives a fixed voicing/tone to each pickup. Follow the link in the post to see a demonstration by ex-custom shop boss Mike Eldred.